As we all know, an Avatar is an Incarnation of God. In a broad sense, everything in the Universe is a manifestation of God. Yet, the term Avatar is reserved for those Incarnations wherein the Lord deliberately assumes a specific form for a specific purpose. The word Avatar means descent. It is not coming down from the peak of a mountain or the top story of a tall building. It is a descent from the state of the Atma to the level of the body. No blemish attaches to the Divine as a result of the descent. There is no diminution in Divine power either. Let us say there is a child playing on the ground. If the mother feels it is beneath her dignity to bend and tells the child to leap into her arms, the child cannot do so. The mother does not ask the child to do such an impossible thing. Instead, full of love, the mother stoops and lovingly picks up the child. Likewise, the Lord incarnates assuming a human form to bless and rescue those who cannot rise to the level of the Divine. Incarnation is an act of benediction. 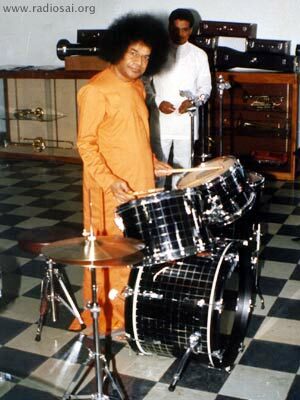 The name Sai Baba means Divine Mother and Divine Father. Like mother, I will be tender and soft and give you happiness, and like father I will punish you when needed. Through these methods I shall take you to a high level. To elevate man to the level of Supreme Consciousness, God has to incarnate as man. God has to speak to man in his own style and language. He has to teach mankind the methods that it can adopt and practice. Birds and beasts need no Divine incarnation to guide them for they have no inclination to stray away from their respective Dharmas. Man alone forgets the goal of life. The essential quality of an Avatar is to teach you to make good and proper use of your thought, word and deed. Depending on the conditions and the environment in the country, the Avatar will teach and show the right use of the Divine faculties gifted to man. In this Kali Age, the wicked have to be reformed and reconstructed through Love and Compassion. That is why this Avatar has come unarmed. The Avatar has come with the Message of Love. My objective is to establish unity in mankind, to reveal the aspect of the Divinity latent in man, and that God must be the only goal in life. It is also My duty to make you realize the kind of relationship that should exist between fellow human beings. There is considerable change in human outlook that I have to bring about. No one can stop Me or deter Me from fulfilling these tasks for which I have come, namely the establishment of the one unchanging Truth. In this task, you have a part to play. You must take a path by which you can see deep in My heart, and experience the various Divine aspects of Mine. You must understand the all-knowing power in Me. Do not be led away by people who always talk of having got a locket or a watch or a ring from Me. These things have no deep meaning. Divine Love is associated with Immortality. It is to teach mankind the truth about this Divine Love that Love itself incarnates on earth in human form. 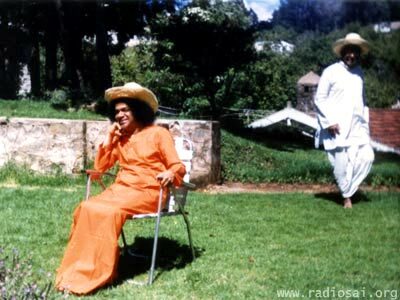 It is to drive home the point that we all are sparks of the Divine, that Swami invariably begins His Divine Discourses with the words: EMBODIMENTS OF DIVINE LOVE, or EMBODIMENTS OF THE DIVINE ATMA. When Narayana takes the form of a man and wants to help humanity, He will act like a man. 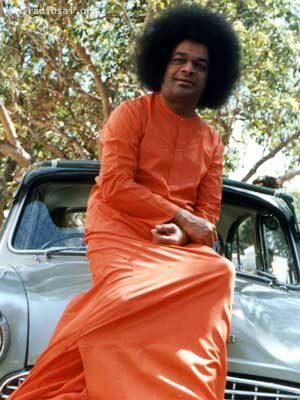 Rama, Krishna, and Sai Baba appear different because of the dress donned, but it is the selfsame Entity, believe Me! When the Avatar appears in human form, we find that He exhibits human consciousness along with Divine Consciousness. Ordinary people cannot grasp the Divine Consciousness of the Avatar. God appears to be an ordinary human being to the limited intelligence of lay people because of the co-existence of the Divine and the human aspects of the Consciousness exhibited by Him. Man's perception is limited to the level of human consciousness. Therefore human comprehension is restricted by the limits of human consciousness. But the Sages of yore were able to cognise the Formless God in the visible Form because they had imbued themselves with Divine Consciousness. Thus, according to their levels, different people regard an Avatar as a mere human being or the Cosmic Reality. Because I am like an ordinary individual when I am talking with you and playing with you, many people do not understand My true nature. Even people with great strength of mind cannot recognize the true nature of Sai, and the difference between the external appearance and the internal aspect. Sai knows everything. That people are in doubt is due to the Maya of the Avatar. There is no use telling people who refuse to know. For people who know, there is no need to tell. But for people who know and yet do not know, it becomes necessary to present what I call My visiting card. Therefore, if today I have chosen to tell you about Myself, it is with a view to present you with My visiting card. In the whole of our spiritual history, we find that only Krishna had proclaimed His Divinity in this manner. To talk of the Vibhuti that I give or to talk of the things that I materialize and the miracles I perform is not correct. Sometimes, I feel like laughing at the ignorance of people when they attach such importance to My miracles. People talk only of such things and forget the much bigger aspect in Me. The most sacred quality in Me is Prema. This Prema is immeasurable! I am Love, Love and Love. I am always Love! Love is everything but people do not understand Love!! Yes, God is Love and Love is God. Thus, Love is the true form of God, and we would do well to always see our beloved Swami as nothing but the embodiment of Purest Love. Since you see me in close proximity, you are not able to assess Me properly. Familiarity has deceived you to the point of delusion. 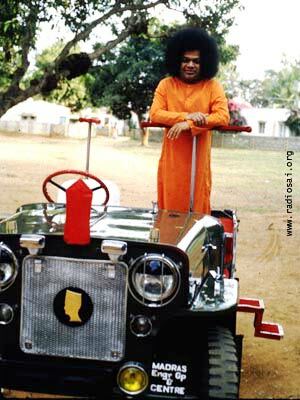 Swami's form is BIG, VAST and INFINITE! The attributes and the power of the Avatar remain unaltered in their pristine amplitude. The Divine manifests His powers according to the needs, the circumstances, and the conditions prevailing at a particular time or place. Take, for example, the case of a Chief Justice of the Supreme Court. He has the power both to protect or punish. These powers can be exercised only when he is sitting in the judicial chair. The same Chief Justice, when he is at home, confers joy on his grandson by letting him ride on his back. By allowing the grandchild to play in this manner, does the Chief Justice forfeit his judicial powers? Similalry, the Avatar does not forgo any of His Supreme Powers merely because He lives and moves amongst human beings as a man. An Avatar is capable of all things at all times. Yet, the Avatar will not undertake to demonstrate His powers all the time. The Avatar will exercise such powers only when exceptional circumstances demand it, and will shed Grace on a deserving person alone. There is no limitation to My Power. There is no reason to limit or confine My Power and My Grace to any one place. Infinite Power and Infinite Grace are present in My hands. To state these things with regard to Myself becomes necessary at times. In an Avatar, there never will be a situation in which you can find fault with Him. The individual who accuses an Avatar will be hurting himself in his eye with his own finger. Inherent beauty and attractiveness are obvious in His playing and in His singing. These are the aspects of SIVASHAKTI that is immanent in Him. 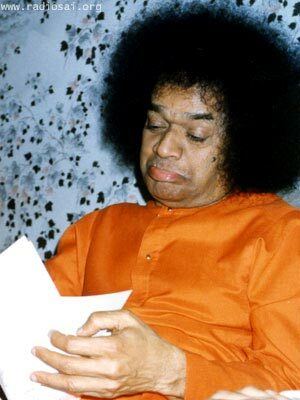 How is it possible for anyone to understand Sathya Sai merely from His external Form? There is no desire in Sai. Where is the space for desire in Sai? Everything is already Mine! Sai does not think. My will is instantly realized. Whatever it may be, it immediately appears. If Balarama [the brother of Krishna] himself could not understand Me, how can you?! I readily give you what you want, so that you may want what I have come to give. And what is it that He is so eager to give us? The very same thing that He gave to Arjuna five thousand and odd years ago on the battle field - the Knowledge of the Universal Self or Atmavidya. That is what the Avatar has come to give us and that really is what we must seek earnestly from Him.